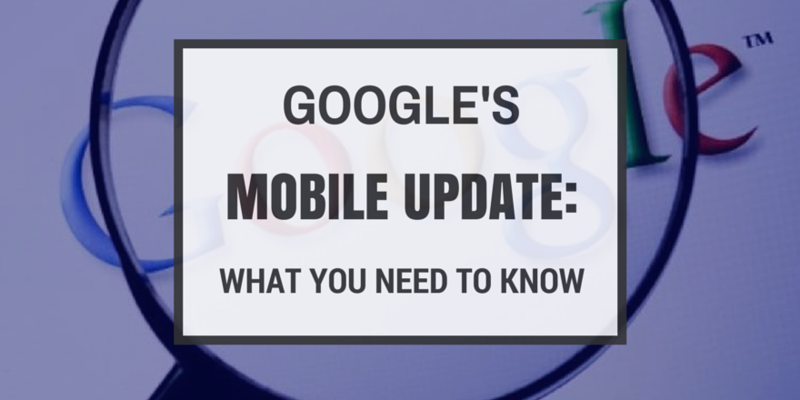 Come April 21st, Google is integrating mobile-friendliness into its algorithm as a ranking signal. This means that, in order for your site to continue ranking on the first page, it will have to be deemed mobile-friendly by Google. But why is Google choosing to do this now? What does this mean for small business owners? And how can you be sure that your site won’t be falling from the ranks? To answer your questions, we’ve put together a brief guide detailing the upcoming changes. And, before you panic, we have good news—Internet Local Listings is already well-prepared for this update. Okay, with that out of the way, read on to find out more about this important algorithm change and how we’re working to make sure this benefits you! Why is Google choosing to implement an update now? Mobile devices are becoming increasingly popular. In the past, online shopping meant sitting down at home in front of your computer and ordering everything from your office. The rise of smart phones and tablets has made it so that you can also shop pretty much anywhere else–on the train, over your lunch break, or wherever you have a wi-fi connection. And with all that online retail space just waiting to be utilized by other devices, marketers are now beginning to plan their strategies to get the most out of mobile advertising. In fact, over the Christmas season alone in 2014, mobile spending went up by 25% compared to 2013. Now, in 2015, the number of mobile users around the world has surpassed desktop users by 200 million people. And it’s only going to continue to grow. That’s a lot of potential business. And Google recognizes that. What does the change entail? Google wants consumers to have a better experience when they search for things–whether that’s a local store that sells the hardware they need or a quick answer to “What is the weather like today?”. Consumers get really frustrated if the top search results come from sites that can’t display properly on their tablet or smartphone. Have you ever searched for something on your phone and went to a site where you waited for five minutes for the screen to load, and in the end the text was too small to read? We all have, and it’s annoying! But this is primarily what Google is aiming to fix: They want all sites to be accessible by mobile devices—and sites that aren’t will be pushed down the rankings in favor of those that are. What does this mean for you? It means that if you haven’t made sure that your site has a mobile-responsive design, it could take a hit in ratings. For example: Currently, if a consumer wants to find a local hair salon and searches for “haircuts” on Google using his or her mobile device, several local results will pop up. But after April 21st, those results could change if those business owners don’t make sure their sites are mobile-friendly. Why? Because after this new update is enacted, Google will make sure that those sites are pushed off the first page when someone searches for “haircuts” on a mobile device, as a mobile user probably won’t find those results relevant. How does this affect my site? Okay, enough with the bad news. The good news is that Internet Local Listings has been hard at work to ensure your website is ready to go with the big change. Because we have prepared your site to be mobile friendly, you won’t have to worry about not being found by nearby potential customers who don’t know about you. That in turn means you won’t have to worry about a drop in website traffic. The Google algorithm change could be potentially damaging to a small business’s rankings, it’s true. But when you choose to work with Internet Local Listings, you’ll never have to worry about being blindsided by Google updates. We keep up with the latest changes to make sure you are ranking. Guaranteed. How do you make sure sites pass Google’s new requirements? We make sure your website code tells browsers how to display your website based on the device accessing it. This is called “responsive design”. Pretty cool, huh? We make sure certain code isn’t being blocked by the browsers of mobile devices. These codes tell Google how to crawl and index your site, images, and videos. If Google can’t crawl your site, you can’t rank. And that’s no good. We make sure that consumers in your area will be able to pull up your business no matter which device they’re using. That way, when they’re searching on the go, you’re still going to be at the top of the local search results. Your sites are customizable to include keywords that suit your business, and of course we also include branded images. That means you don’t have to worry about compromising an appealing website design for the sake of accessibility! In 2014, 72 percent of consumers who searched for local information on a mobile device ended up visiting a store within five miles of their search location. 50 percent of consumers who conducted local searches chose to visit one of the ranking stores within just one day. Do you see how important it is that you are able to be found via mobile devices? If you aren’t up to date with these changes, you will lose out on a tremendous amount of traffic to your website—and in turn, potential customers. Although this all sounds worrisome, our clients can rest assured that we are prepared for this monumental update. We understand how important local businesses are, and since we opened our doors in 2011, we have continually improved our proprietary software to accommodate the unique needs of small business owners across the United States and Canada. We make it easy for you to be seen online so you can focus on what’s important—running your business. So bring it on, April 21st! Internet Local Listings is ready for the changes, and as our valued clients, you will be too!